Like many highly developed dogs, Pugs as a dog breed suffer numerous health issues, primarily as a result of their short snouts. As a result, they suffer from various breathing difficulties. The more common Pug health issues are explained below. You’d be surprised at the number of Pug health issues you could actually diagnose and treat yourself, at a fraction of the cost of taking your Pug to the vet. Written by vet John Bleby, The Dog’s Health from A-Z: A Canine Veterinary Dictionary, describes how many canine illnesses can be self-diagnosed and treated, or avoided altogether, with a little knowledge and understanding. While this book cannot take the place of your vet, it certainly demonstrates that there’s much you can do to prevent many problems happening in the first place. We are more than happy to recommend this excellent book which is certain to pay for itself in the fullness of time! Also known as ‘trick knee’, patella luxation is a medical condition that affects many small breeds of dog. It also affects a number of larger dogs, although to a lesser extent than with the smaller breeds. Typically becoming evident at an early age (4-6 months), it is a congenital condition in which the patella or kneecap dislocates easily due to the shallowness of the socket in which the patella sits. Depending on its severity, this condition may require surgery to correct the abnormality. If left untreated in the severest of cases, this can also result in osteoarthritis, a degenerative disease of joint cartilage due to the unnatural mechanical movement of affected limbs. Hip dysplasia is the most common inherited orthopaedic disease in dogs. While this progressive disease affects mainly the larger breeds of dog, it also occurs in many of the smaller breeds including the Pug. This problem can be made worse, particularly for Pugs, by carrying excess weight as a result of overfeeding by well-meaning but over indulgent Pug owners. Elongated Soft Palate is the major cause of breathing difficulties with Brachycephalic dog breeds. Such breeds, which include the Bulldog, the Boston Terrier and the Boxer, are those who through successive breeding programs over time have had their heads effectively compressed such that the normal and natural ratio of length to breadth of the head have been altered. This is what gives breeds such as the Pug their squashed faces. With such dog breeds the soft palate, the flap of skin at the back of the throat, has remained its natural length while the head has been compressed or shortened. This means that the soft palate overlaps the epiglottis (which prevents food and liquids from entering the lungs), narrowing the animal’s airway and thus restricting its breathing. Amongst other things, this also increases the Pug’s propensity to suffer from heat stroke. Cleft Palate is another congenital birth defect caused by the unnatural compression of the head of the Pug and other Brachycephalic breeds of dog. The incidence of what is known as screwtail in dog breeds such as the Pug is the result of hemivertebrae, probably caused by a lack of blood supply to the vertibrae. Although screwtail in itself is not life threatening, if this condition occurs in other parts of the spine it can result in paralysis or early death. PDE is a hereditary disease specific to Pugs. It is perhaps more commonly known as inflammation of the brain. This debilitating and eventually fatal disease can cause seizures and dementia in its early stages, and later what is known as head tilt (Torticollis) and blindness. There is no known cure for this terrible disease. A congenital medical condition, Entropion can be found in many dog breeds, including Pugs. It results in the eyelids folding inwards and causing discomfort when the eyelashes constantly rub against the cornea. Providing it is noticed early enough before the cornea is damaged, this condition can be treated by a relatively simple operation in which the excess skin of the outer eyelid is removed. Pugs, along with other small and toy dog breeds, are particularly susceptible to Legg-Calve-Perthes Disease. It is a painful, degenerative disease of the hip joint which can successfully be treated with surgery to remove the head of the femur (thigh bone). Because of their protruding eyes and their lack of a discernable brow ridge, Pugs tend to be more prone to eye injuries than most dogs. Care should be taken when exercising or playing with your Pug. 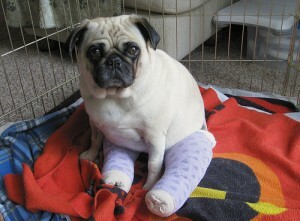 We would thoroughly recommend you take out insurance cover for your Pug. For the cheapest Pug insurance, please visit Compare Dog Insurance.